The Terra Cotta Earth Tones Rose is brown-orange-rust toned rose. The Terra Cotta Earth Tones Rose opens into a full, classic-shaped bloom with slightly ruffled edges. This deep, burnt orange novelty rose is a favorite for wedding bouquets, floral arrangements and lavish centerpieces. Free shipping! Proper flower care begins with the timing of your delivery. We recommend you schedule your flowers to arrive 2 to 3 days before the actual event. For a Friday or Saturday wedding your flowers should be delivered on the Wednesday before. Normally they will arrive before 10:30 am, depending on your service area. Since your roses will be shipped direct from the farms, you will be receiving them at the same stage as a flower wholesaler. So they will probably look different than you are used to purchasing. After they have been properly hydrated and put into a state of suspended animation, they ship in dry packs (usually). It is NORMAL for your flowers to appear sleepy and thirsty on arrival. With proper care, they can last up to two weeks or more. A few hours after hydration, they will perk up and look dramatically different. 1. Carefully unpack rose from box by cutting any straps. Remove packaging from the stems, but leave any plastic or paper covering the blooms for the first few hours while the flowers re-hydrate. Also leave the rubber bands holding the stems together for the first 4 hours or, if you wish, until you are ready to start arranging flowers. If you want to leave the packaging on the blooms, be sure to loosen it so they can breathe and not trap condensation. 2. Fill clean containers with at least 4 inches of fresh, cool water. If you can get some floral preservative at a flower shop, that will prolong floral life. As an alternative, you can use some Sprite and a few drops of unscented bleach (6-8 drops per gallon) to inhibit bacterial growth. 3. Remove all leaves that will be under the water level. Remember that foliage should never be in contact with water. Leaves left in water will tend to rot and create bacteria that shorten vase life. 4. Cut stems diagonally about an inch from the base of the stem with sharp scissors or knife. 5. Immediately after cutting, place the stems in the prepared water. The flowers will drink an exceptionally large amount of water upon arrival. Allow flowers at least 4 hours to hydrate well. Some flowers take up to 12 hours to hydrate fully. 6. Keep flowers away from direct sunlight, heat and air vents, television sets or excessive heat. Generally, the cooler the temperature, the slower the flowers will open and the longer their life. Avoid refrigerators or walk-in coolers not specifically designed for flowers. 8. Re-cut the stems about one inch and change the water every two or three days to keep flowers fresh. Clean the vase. 9. Add water as flowers absorb it, or change it thoroughly. 10.To maximize the life and beauty of your roses, remove the first layer of protective guard petals. They are normal, and are not a sign of damaged or old flowers. These guard petals protect the blooms while they grow and were left on to protect your roses during shipping. 11. Roses are in bunches of 25 stems, in a two-tier system. If you see only 12 roses at the top of the bunch, don not panic! The others are directly below. 12. Leave the plastic or paper wrap around the heads for the first 4-6 hours of hydration. 13. When you arrange the roses, and afterward, feel free to remove any petals that are unsightly. Florists do! 14. If your rose bends and looks like it is wilted after using the above steps, remove the rose from vase, fill a small garden tub with water, and cut 1" off the bottom of rose again and totally submerge your rose in water. Shake the rose under water until air bubbles come out of the rose head. With fresh rose petals you will want to avoid two things: (1) Moisture and (2) Freezing Temperatures. Fresh rose petals are packed in bags of about 1,000 petals. When you receive the bags, carefully open one end of the bag, fold a paper towel in half, and slide it inside the bag between the bag and the rose petals. Turn the bag over and repeat the process, lining the inside of the bag with paper towels. The towels will catch any condensation that forms. We recommend storing the fresh rose petals in a refrigerator. Keep your eye on them since every refrigerator differs in temperature and humidity. Do not put your rose petals in an area of the refrigerator prone to freezing. If the fresh rose petals look as if they are drying out, remove them from the refrigerator and store them in a cool spot out of sunlight and away from heat (such as in the garage or basement) in the box they came in. For your Wedding or Special Event, we recommend that you have your Wholesale Flowers or Wedding Flowers delivered 2 to 3 days before the actual event. For a weekend event, your flowers should be delivered on the Wednesday (or Thursday at the latest). Schedule lilies 3 to 5 days before your event so they have time to open. We use FedEx for overnight delivery service. Your flowers will most likely be delivered before 10:30am. If you are in an extended delivery area, they should arrive by 5p.m. Contact FedEx for the guaranteed delivery time for your delivery zip code. Over 80% of the wholesale standard roses used in the United States are imported from some of the world's best growing regions in the mountains of Colombia and Ecuador. Equatorial sunshine, long days, and cool nights help roses grow in the rich, volcanic soil producing the long, sturdy stems and larger heads for which these roses are famous. They are widely used for wedding flowers, special events, fund-raisers and other floral decor. Roses from Colombia and Ecuador have a long vase life when properly cared for. Generally longer stems mean slightly larger rose heads, but not always. The 16-inch (40cm) roses are are the shortest roses. Shorter stems make these roses ideal in arrangements where stem length is not an issue. 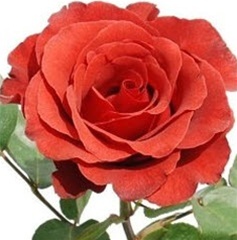 The 20-inch (50cm) wholesale roses from Colombia and Ecuador are our most popular size. Their longer stems and larger heads make them ideal for all arrangements and bouquets. The 24-inch (60cm) wholesale roses are the favorite of retail flower ships for use as "long-stemmed" roses. The 28-inch (70cm) roses are for when your requirements are for a longer stem or even larger head size. Options: Select your stem length and pack from the drop down menus. Actual color may vary with variety or the computer monitor you use. If you need a special assortment, please specify in the text box and check out, or call us at 1-877-553-9917. Most of the time we can accomodate special requests. Packing: Roses come in bunches of 25 carefully packed stems. Within each bunch, the roses are packed in two layers for protection during shipping. From a top angle, it may appear that you only have 12 stems in the bunch. However, the remaining 13 roses are in the layer below. Each bunch consists of the same color and variety rose. Stem length refers to the shortest stem in the bunch. Prices: are subject to change due to market conditions, especially fuel surcharges due to the volatility of oil prices. These prices are not available at least two weeks before Valentine's or Mother's Day.